Earlier we always bring sandwiches or a stove on our daytrips but now we have another favorite food. 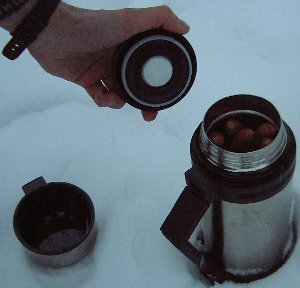 Instead we bring a thermos filled with hotdogs in warm water. Of course we also have ketchup, mustard and bread with us. According to secure sources the hotdogs are much better than the Norwegians cold sandwiches. Don't be surprised if some hungry person will pay you almost anything for just a bite! 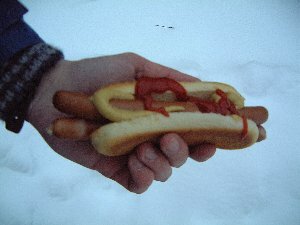 Hotdogs are also nice after a hard running or ski-tour. You can buy special thermoses witch are better suited to contain hotdogs/warm food. Our thermos is equipped with two openings, one in the top for ordinary liquid, the other one a little bit down from the top witch opens the thermos totally (see below).